Wait, what?! Regal Cinemas has announced a special "ultimate" ticket for the upcoming 24th Bond movie, titled Spectre, starring Daniel Craig as 007, once again directed by Sam Mendes. The cinema chain has revealed a special ticket that, for $100, allows any moviegoer to go see Spectre once a day for the entire run of the movie - which will likely be 3 or 4 or maybe 5 months at most. The kicker, or the real prize as it should be affirmed, is the limited edition "first-of-its-kind black anodized steel collectible" laser etched Spectre ticket card that you will receive and use to get access to the movie. Awesome. Now I want this, hell, just for the card, not even for the movies (which is probably the whole plan, if you think about it). Read on. Here's the only other info as listed on the sales page for the "Spectre Ultimate" ticket from Regal. Want in? 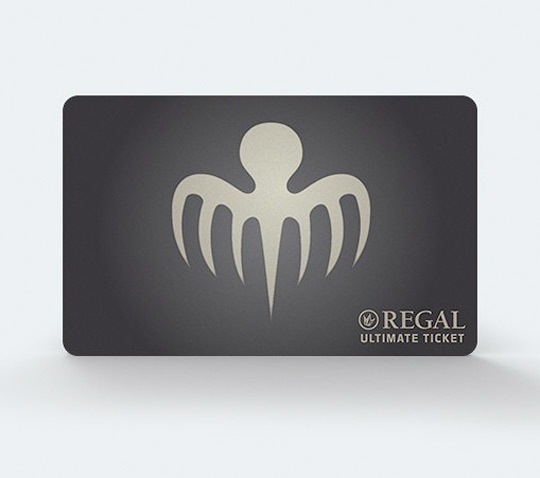 Guests with the Regal Ultimate Ticket can receive one admission to "Spectre" each day for the entire run of the movie in Regal theaters. This first-of-its-kind black anodized steel collectible is laser etched with the iconic Spectre symbol. Each will be personalized FREE with the recipient's name. Hurry! Production is limited to only 1,000 available units. In all honesty, there aren't really any other big catches to this. It's pretty straight forward - you get to see Spectre once a day at any Regal cinema. The only details it mentions are that the card is only accepted at the box office, not online. Otherwise, you need a photo ID and the cards are not transferrable. Standard stuff. "Guests with the Regal Ultimate Ticket can receive one admission to Spectre each day for the entire run of the movie in Regal theaters." It's particularly nice that they don't set a big end date - except for June 6th, 2016, which is almost 7 months after the initial release. If you went to Spectre every day from release until June 6th, you could see it 213 times for $100 (or $0.47 per movie). Now that's a deal. More of this Regal. We'll see you in theaters later this fall - Spectre (see the latest trailer) opens on November 6th. Bond is back.